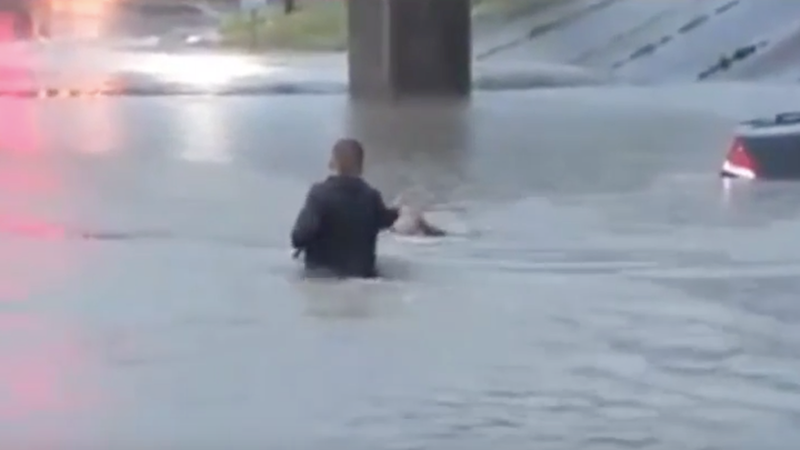 On Monday morning, a Houston TV reporter rescued a man whose car got swept away by the record flooding hitting the city. Steve Campion of ABC13 was about to report live from downtown when he saw a Honda Insight get swept toward an underpass — with the driver still inside. In a clip, Campion can be heard yelling to the unidentified middle-aged man, "Dude, you've got to get out of the car. You've got to get out!" The man does, and begins to swim toward Campion. The man was unharmed. Watch the clip below. "I did not think it was that deep," the man says. A Youtube account posted a fuller video below. The immediate cause of the floods was a heavy storm system moving through the area, combining with "rich Gulf moisture," WHNT reported. Up to 20 inches of rain fell in the span of just six hours early Monday morning. Over five dozen high water rescues had been performed as of 7 a.m. Monday, according to KTRK. All inbound flights were put on hold at their city of origin, dozens of schools were closed, and the city suspended bus and rail services. But Houston, and Texas in general, has seen, and can expect to see, flooding increase thanks to climate change, according to the U.S. National Climate Assessment, as warmer conditions in oceans strengthen the winds that move moisture from the Gulf of Mexico to the southern Great Plains, CBS said. "When an extreme event occurs one must factor in some role/influence that the underlying changes are exerting on things," David Robinson, a climatologist at Rutgers University, told CBS last year. "For instance, making a wet spell somewhat wetter, a heat wave longer and more extreme, a drought more extreme and covering a larger geographic area."